The photos above say it all. Before the limestone deck and coping surrounding the pool could be sealed, the mildew and mold stains had to be carefully removed by our professional cleaners. 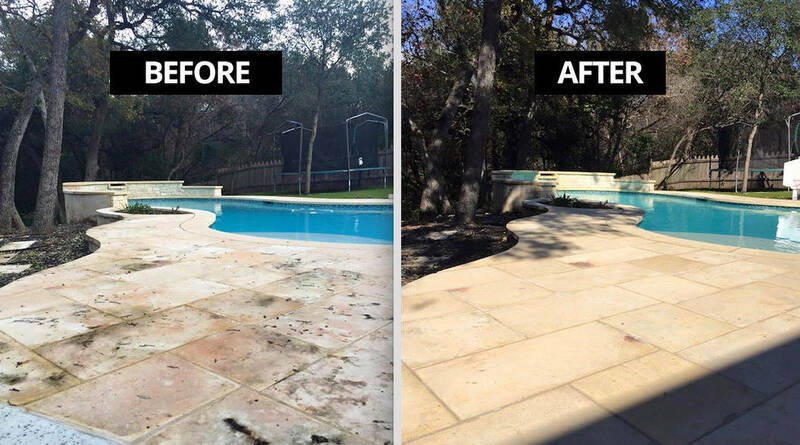 Once the stone was cleaned, we added a coat of TSSPRO natural lime stone sealer to the pool deck to help protect it year-round from water damage, prevent future mold growth, and protect the stone from the chlorine and other pool chemicals. The fresh coat of natural stone sealant should protect and enhance the limestone for up to four years in most cases. The type of cleaning your stone requires depends on where the stone is located, what type it is, and what it is exposed to. If the stone is exposed to harsh pool chemicals, like the one above, we recommend using a high performance sealant like TSS-PRO 200. On the left, the newly installed, bare flagstone is left vulnerable to the elements including water impregnation, mold growth, calcium efflorescence, and sun damage. Because the flagstone is installed around a pool, it is also vulnerable to damage from pool chemicals, saltwater, and surface scratches from foot traffic and furniture. On the right side you can see the color-enhancing sealant in action, as the TSSPRO-300 sealant cures to a semi-gloss finish. The sealed flagstone patio is now protected from saltwater and chlorine damage in addition to sun and abrasions. 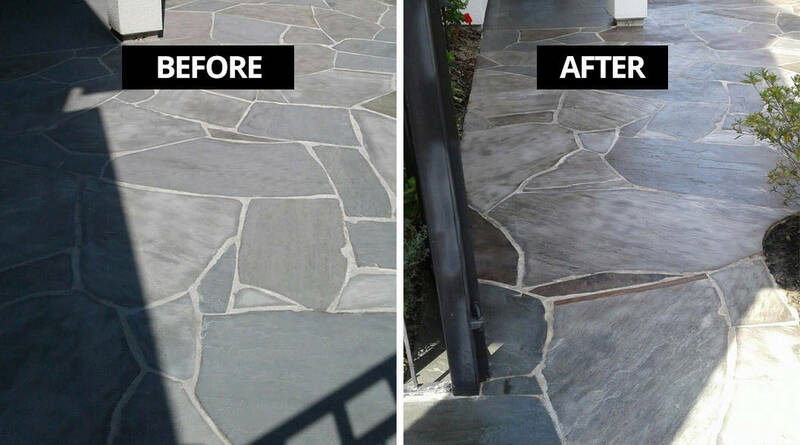 The bluestone tile patio on the left is unsealed and susceptible to water penetration, mold, and mildew damage. Over time, exposure to rain, sun, changing temperatures, and foot traffic can lead to stone erosion and staining. 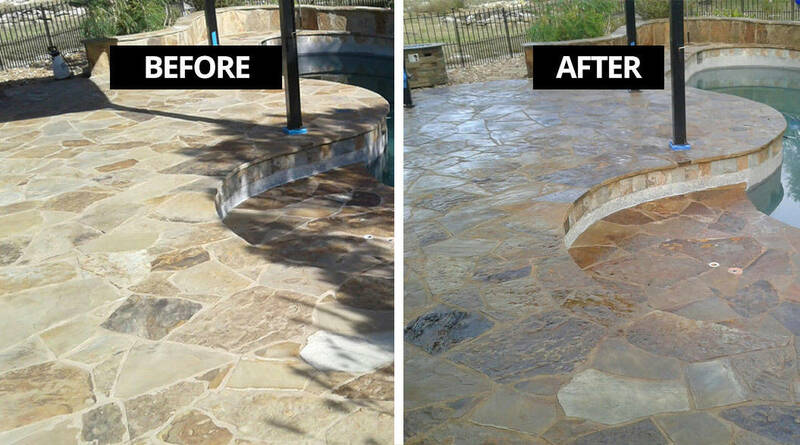 On the left, you can see how the TSSPRO-300 WetLook natural stone sealer on the patio’s bluestone tile looks. The color variations are deepened, and the low-gloss finish gives it a hint of shine without making it too slippery or glossy. Cosmetic improvements aside, the Tennessee bluestone is now protected from water, mold, sun, and erosion damage.